Product prices and availability are accurate as of 2019-04-18 14:48:22 EDT and are subject to change. Any price and availability information displayed on http://www.amazon.com/ at the time of purchase will apply to the purchase of this product. This set is Hand Painted This is made of ceramic The design is of a cluster of purple grapes salt & pepper shakers. They measure aprox 3 tall x 6" long. 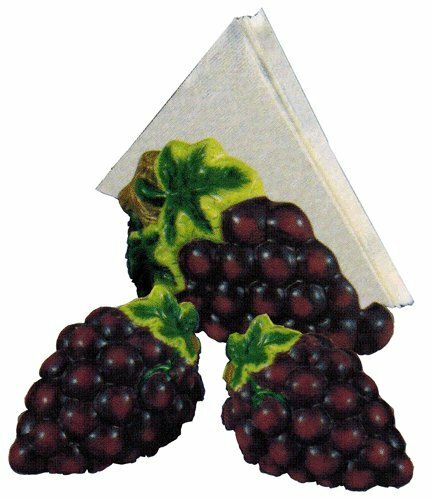 The napkin holder has same cluster grape look. This measures 8" long x 4.5" tall x 4" wide. This is a nice large kitchen set! This is an adorable piece and would brighten up anyones kitchen. Create a personal and elegant touch to your Home! Great as a Gift! Perfect for any Grape Collector! Excellent attention to detail and such vibrant colors! Usefull and stylish all in one!